A couple who met at Brighton Dome have returned to the venue to launch a public competition to name a seat in the refurbished Corn Exchange or Studio Theatre. Matt and Marianne Barton from Hove contacted the venue as part of a memory project which asked the public to share their special stories of Brighton Dome. The couple met at a concert in 2015 and are now married with a 12-week old son, Barnaby. Electrician Matt, 36 recalled the evening: "We met at The Gaslight Anthem gig in the Concert Hall. "We had mutual friends who were loitering at the back, so we thought we"d push straight to the front and stayed there for the whole gig!" Visitors to Brighton Dome can enter the competition via a ballot box in the ticket office or on the venue's website. The winner will have the opportunity to dedicate an engraved seat plaque to a loved one, a friend or a memory. The competition is part of the Build Brighton Dome community appeal to support the transformation of the Corn Exchange and Studio Theatre. To date, over 6,000 people have donated £50,000 which has been matched pound for pound by the Roddick Foundation, taking the total raised to £100,000. The appeal aims to raise a further £200,000 by mid-December. 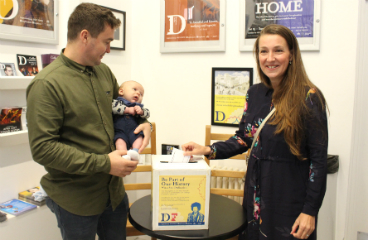 "Dedicating a seat in one of our refurbished theatres creates a lasting legacy for individuals, families, communities and businesses, as well as supporting the transformation of these historic buildings .. "
The couple added: "We're supporting the Build Brighton Dome campaign because the venue is a special place for us and we hope more people will share similar experiences .."
To enter the Build Brighton Dome name a seat competition or to donate to the community appeal CLICK HERE.